Good quality, excellent price what more is there to say. These mop heads are sold individually or can be purchased as a case of 40. I've just brought these and they don't fit my mop handles. Do both the mop handles that you sell fit these mop heads? Yes, this mop head is designed to fit on both our telescopic and non-telescopic mop handles. They can be a little tricky to fix together, but there is a really helpful instructional video on the mop handle section of our website. Hopefully this will help. 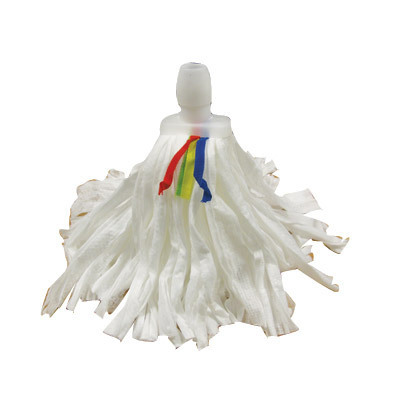 Taking a traditional cleaning tool, our White Non-Woven Mop has been manufactured from twine and features a durable plastic socket. Designed for repetitive use and ideal in busy, high-traffic work environments, this durable mop has been noted for its high absorbency and reliable function in the event of a spill or soils. Suitable for use with most traditional mop buckets and compatible with our aluminium mop handle, each non-woven mop head has colour coordinated tabs to help prevent of cross-contamination or to fit in with your work environments existing supplies. Pair your Non-Woven Mop Head with our Mop Handles and Gompels Lemon Floor Gel for floors that sparkle and shine like new in seconds. Why not take a look at our Soft Sweeping Broom Head and Dustpan & Brush Set while you're here to ensure all your tools are of the highest quality.